Both Sam Foley and David Buchanan have emotional memories of playing at Newport County’s Rodney Parade ahead of tonight’s return to south Wales – but for entirely different reasons. While Foley spent three years and made well over 100 appearances for the Exiles between 2009 and 2012, Buchanan was part of the team the last time Northampton played at Newport, which came during a significant moment in the club’s history. I’ll go back and see a few smiles before the game but hopefully we’ll turn those smiles into frowns afterwards – that’s the plan anyway! Just 24 hours before their clash across the border in October 2015, Northampton confirmed players and staff had gone unpaid for the month of October as their off-field financial problems mounted and the very existence of the club came under threat. Rodney Parade witnessed some emotional scenes between players, staff and fans on that dark afternoon in south Wales as Town, third at the time, surrendered a two-goal lead to draw 2-2. Little did they know it at the time though, the Cobblers would then go on a remarkable run of form as Kelvin Thomas rescued the club and then Chris Wilder did the rest, leading their march to the League Two title. The tables have turned this season with Newport riding high in fifth and the Cobblers struggling in 15th. “Newport have started really well and we’ll respect every single opponent in this league, no matter where they are,” added Buchanan. “We’ll get back on the training pitch and we’ll work on how we’re going to beat them. It won’t be an easy task as they’ve done well at home, but they lost on Saturday so we’ll have to be on a guard because they want to bounce back. 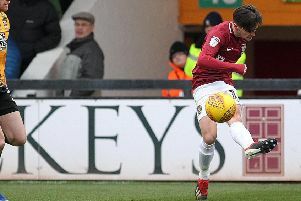 Foley enjoyed three successful years as a Newport player, helping the club win promotion from the Conference South with a record 103 points before then playing under former Cobblers boss Justin Edinburgh. “Hopefully I’ll get a good reception because I had some great years there during the earlier part of my career,” said Foley. “I was part of a very successful team so it’d be good to go back there and see a lot of familiar faces, but I’ve got a job to do in a Northampton shirt, not a Newport one.